It’s sad for me that my parents are spending long days at Duke Cancer Center this week, and I’m not there with them. I try to go along for Daddy’s appointments as often as I can, but they are staying for several days in a row this time. It’s comforting to know that my parents are surrounded with the love and support of their friends and family, through cards, phone calls, visits, and even text messages now and then. The Word tells us to “Carry each other’s burdens and thus fulfill the Law of Christ” (Galatians 6:2). I’m so thankful for dear people who have devoted themselves to my parents, my husband’s parents, and our families in these past few months. Neighbors mow the grass. Family members and friends bring meals. Words of hope arrive in the mailbox. Phone calls and emails remind us that prayers are sincerely spoken. Prayer quilts are carefully stitched, and the ties that bind families and friends together grow tighter. These kind gestures, according to Galatians 6:2, are fulfilling the Law of Christ. Which makes me wonder – what does that mean and why is it important? The Law of Christ is a law of love. Romans 13:9 ~ For the commandments say, “You must not commit adultery. You must not murder. You must not steal. You must not covet.” These—and other such commandments—are summed up in this one commandment: “Love your neighbor as yourself. Through His sacrificial death, Jesus set us free from the curse and the burden of the law of Moses. Jesus Himself invites us, “Come to me, all who labor and are heavy-laden, and I will give you rest. Take my yoke upon you and learn from me; for I am gentle and lowly in heart, and you will find rest for your souls. For my yoke is easy, and my burden is light” (Matthew 11:28–30). How could the Law of Christ – the law of love – be burdensome? This past weekend, I spent much time in community. As you know, being a part of any community is a commitment. I participated in a birthday party, a birthday lunch, and a baby shower. I worshipped and served alongside my church family. We visited my folks. I sent and replied to emails and texts. We had friends over for dinner. To be honest, there were moments when I felt physically, emotionally, and spiritually worn. If the law of love – the Law of Christ – cannot be burdensome, then true love and true community has to come from a source outside of my own physical, emotional, and spiritual resources. Community-living is a commitment, whether I am celebrating with others or commiserating with them. Sure, it takes intention, time, and energy, but would I want to live any other way? Sometimes I can’t find the right words to express comfort or encouragement. Sometimes I don’t have answers to difficult questions. That’s okay. Christ doesn’t ask me to fix another person’s difficulty, He simply asks me to lend my shoulder underneath their load. So when I fulfill the law of love, I acknowledge that I’m not the one who bears another’s burden. It is Christ in me. I empty myself, He pours out His love. The law of love requires us to live more humbly, love more authentically, to give and receive more graciously. We don’t do so alone. The Spirit of love empowers us to love. The command to carry another’s burden is in itself not a burden. It’s an invitation for a community to Come. “Come to me, all who labor and are heavy-laden, and I will give you rest. Take my yoke upon you and learn from me; for I am gentle and lowly in heart, and you will find rest for your souls. For my yoke is easy, and my burden is light” (Matthew 11:28–30). This entry was posted in Fighting for Joy, Following Christ and tagged Carry each other's burdens, Community, Galatians 6:2, the Law of Christ, the law of love on June 26, 2013 by Renee Ratcliffe. I laughed, but it was okay because Muriel and I have been friends for awhile now. 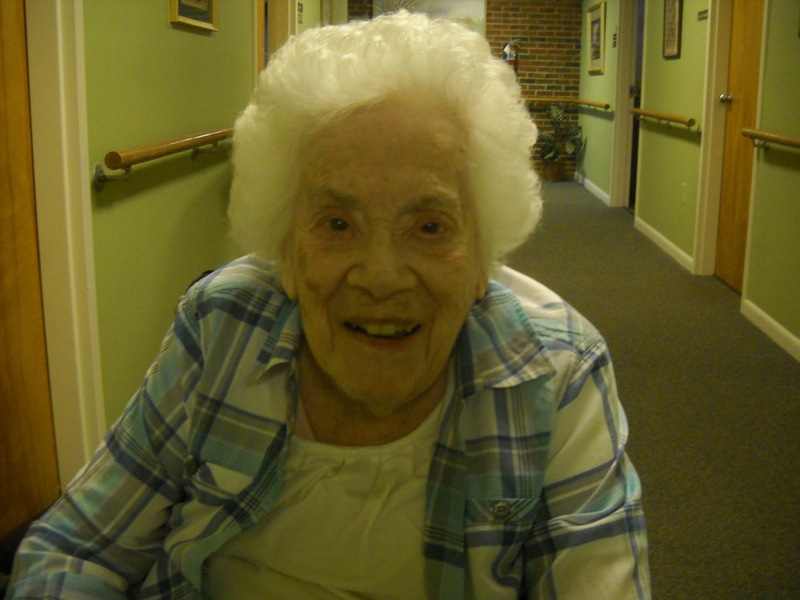 Muriel says lots of things that make me laugh. All these years (and hardships) haven’t diminished her witty sense of humor. Of course you will, my friend. Surely you will receive a beautiful reward from your Lord and you will joyfully lay every crown at His feet. “Seventy years ago I set sail for Africa to become a medical missionary. The war (WW II) was still on so the only way to get passage was to go as the ship’s nurse. We sailed in full blackout down the coast of the U.S. to Brazil where we began our trip across the Atlantic. Most ships that were going went in convoy in case of a German submarine attack. Ours was a very fast ship so we went alone. We got across the Atlantic near to the coast of Africa when we were sighted by a submarine. Because of our speed, we were able to outrun it and land safely at the Port of Matadi in the Belgian Congo. I was assigned to a station on the border between Congo and Uganda. I was thrust into a place where I knew no French, no native language, and nothing about tropical medicine! I had to learn the native language, to sew up the wounds of Africans gored by buffalo or torn by lions and leopards, deliver babies, and treat tropical diseases. I was in charge of a dispensary where we treated 50 – 80 patients per day. Before work began we had a Gospel service that every patient attended. At the end of five years I returned to America for a year of furlough. Then I went to Belgium for one year of study in tropical medicine – all in French! When I returned to Congo I was assigned to a new station up near the border of French Equatorial Africa. There I was in charge of a leprosy colony of about 100 patients. There was no cure for leprosy then, only care of ulcers and making patients as comfortable as possible. I was there for 4 years, then a year of furlough. These days, this amazing ambassador who nursed hundreds of broken people depends on nurses herself. While her earthen vessel is weak, Muriel’s spirit is strong. She chooses to be thankful. Some days are better than others, but Muriel chooses to look beyond what she experiences in any given 24 hours. 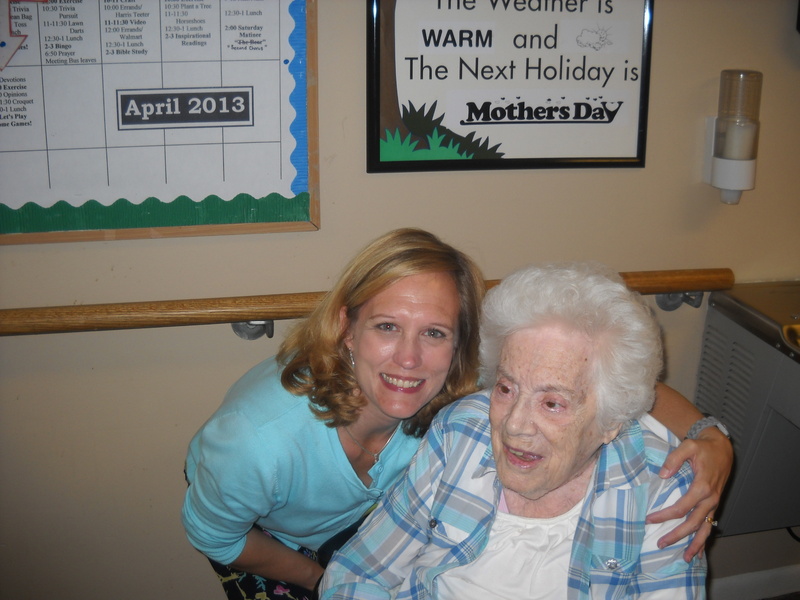 The lyrics to a song are taped to the door of Muriel’s room in the nursing home. 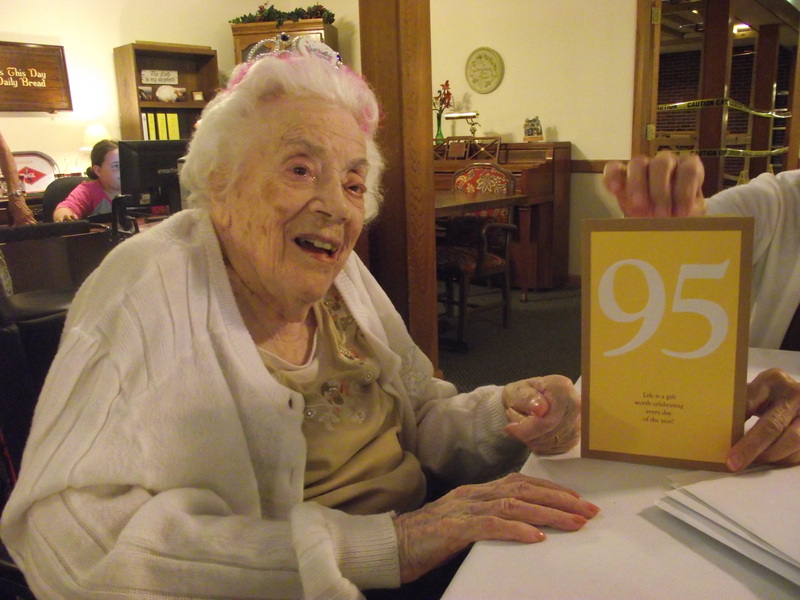 I don’t know where the wrinkled piece of paper came from, but the words there perfectly describe how Muriel has lived. Some day life’s wrongs will be made right. But God in love a veil doth throw across our way. He leads us till this life is o’er. 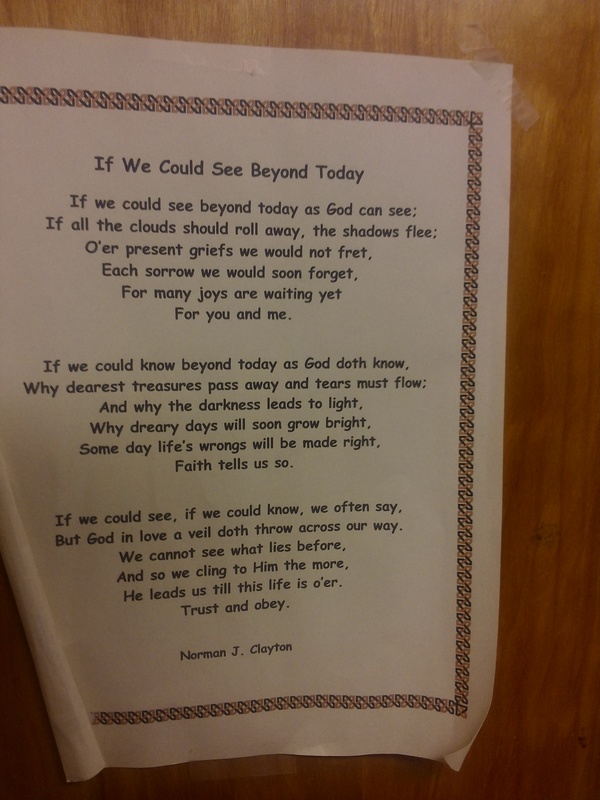 This entry was posted in Eternity in Our Hearts and tagged eternal life, future, Hope, Perspective, Thanksgiving, Tomorrow on June 20, 2013 by Renee Ratcliffe. “I’m kinda scared,” my girl confessed as we stood at the ocean’s edge. The day ahead had the potential of a dream-come-true for this eleven-year-old who had long yearned for sand and salt water. It’s a bummer for Caroline that her parents are mountain people. Tell me and John to “take a hike,” and we say “gladly,” as long as we can follow a trail along winding streams under a canopy of trees. 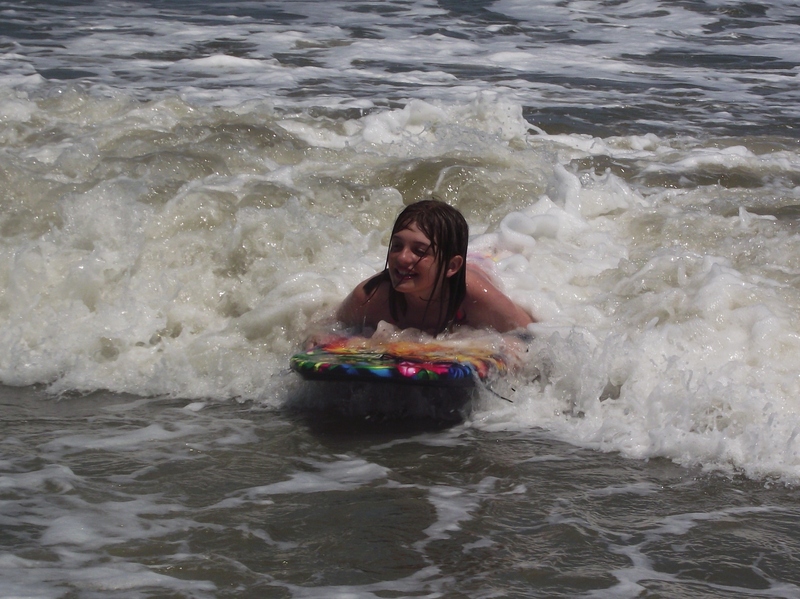 But this weekend at the beach was a free gift offered by hospitable friends, and Caroline was ready to dive in. Well, maybe not literally. The crashing of waves and the tug of the tide gave her pause, but John was ready to play. 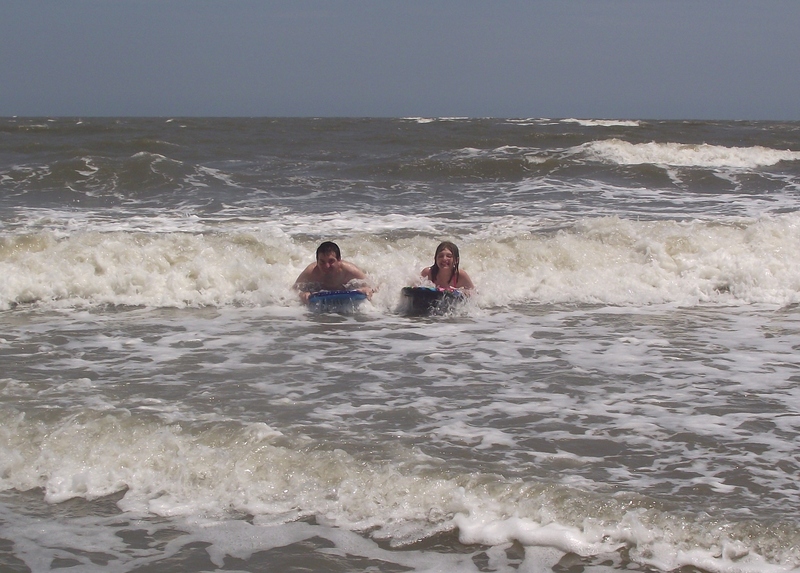 At her dad’s urging, Caroline cautiously braved ahead, and after hours of wave riding, all fears were joyfully conquered – as long as John was near. On Father’s Day, I especially appreciate the strong, protective love of fathers – that special kind of devotion that hangs on through high tide and low tide. The steadfast commitment of a father to his children gives them a kind of safety and security like no other. It’s a love that’s meant to image the love of a Heavenly Father. That’s a BIG task! But on Father’s Day, we honor our dads who do just that, not by being perfect but by being present. God gives us glimpses of His love through the fathers who shoo monsters from under the bed, toss a ball in the backyard after a long day at the office, coach the soccer team, attend countless recitals, stay up late and rise early, make sure the college student’s car is properly maintained, write the checks, write the checks, write the checks…. I learned a long time ago that I can’t out-give my Daddy. He is the most generous person I know. Not just financially but in every way. He has poured himself into his family. He has taught us to work hard, to love Jesus and love people. He cheers for us in his own quietly proud way. His gift to his family has been his presence. He has been lovingly committed to his wife for 61 years. He serves as an example of trustworthiness and integrity. When we are afraid, we remember that Daddy reads his Bible and talks to God. When we are tempted to give up, we remember that Daddy has been fighting cancer for a long time, and he trusts God. When we celebrate, we remember that Daddy has given us a legacy of family and faith – the gifts most worthy of celebration. When we feel like failures, we remember that Daddy calls us “sugar” and “honey,” and nothing will change that. When we need help, we remember that Daddy has a cell phone. For me and Daddy, some of our memories were made, not at the beach but in the amusement parks. From Daddy I learned to love roller coasters and fast rides (but not spinning rides – they made him sick). I remember, as a little girl, feeling brave and big with anticipation as we entered the line of Space Mountain or the mine train. As the coaster cranked up the hill, I was afraid, but Daddy was there, so I figured it would turn out all right. I trusted the love of my father, and it gave me great joy. I remember how he laughed as we sped around the loops and corkscrews. My heart was full just to know that he enjoyed being my dad. Life, as we now know it, offers a different sort of twists and turns and things that are scary. Some days we don’t feel so brave. But together we trust that our Heavenly Father is here, and it will turn out all right. I realize that some people didn’t have the love of a dad like I did. I understand that this can make it harder for them to comprehend the love of the Heavenly Father. If it’s true for you, I hope and pray that your empty place can be overcome by the amazing gift of fatherhood that God offers to you through Jesus Christ. When you feel like a failure, remember that “The Lord is compassionate and gracious, slow to anger, abounding in love. He will not always accuse, nor will he harbor his anger forever; he does not treat us as our sins deserve or repay us according to our iniquities. For as high as the heavens are above the earth, so great is his love for those who fear him; as far as the east is from the west, so far has he removed our transgressions from us.” (Psalm 103: 8 – 12). And if you’re a father, remember your family doesn’t need you to be perfect. They need you to be present. Wait in line for the roller coaster. Go in the ocean. Become the image of a Heavenly Father who holds on – through the highs and lows and through the waves. In His grip, it will turn out all right. This entry was posted in Encouragement, Thoughts on faith and tagged Father's Day, Heavenly Father, Hope, Psalm 103 on June 14, 2013 by Renee Ratcliffe.